This egg-shaped felt pouch is easy to trace from our free pattern, then to cut and glue together. The best part is the creative decorating that you can add to the front. Once you are finished this Easter craft project, fill the pretty pouch with Easter stickers or some candies. 1. 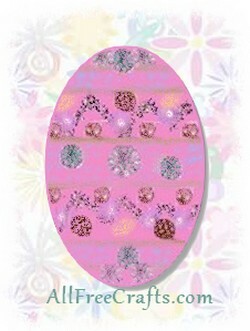 Print and cut out our free Easter Egg Pouch Pattern. 2. Trace the pattern onto felt twice, and cut out the two egg shapes. Take one of these egg shapes and cut a slit in the center as shown in the pattern. This will be the back of your pouch. 3. Decorate the other egg shape. Some suggestions that you might use for decorations include beads, confetti, rick rack, ribbon, fabric paint, glitter, rhinestones or sequins. 4. Glue around the back edges of the egg shapes and press the two egg shapes together. Let dry. 5. Fill with Easter candy or stickers.